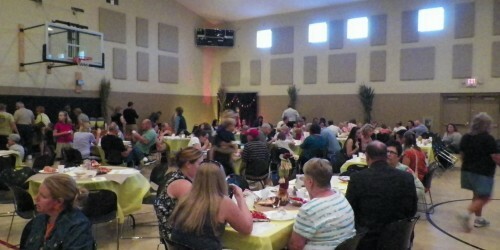 Redeemer has several spaces in our facility which are available for rental for special occasions — both for church- and school-related functions and for events hosted by outside organizations or individuals. Redeemer’s Family Life Center consists mainly of a large multipurpose space that is suitable for athletic events, banquets, programs and fairs. It offers a regulation-size gymnasium with bleachers along one side that can expanded or retracted as needed. It is connected to a commercial-grade kitchen by a large serving counter. Also nearby is an attractive conference room with modular tables, as well as dedicated restrooms. The entire Family Life Center is wheelchair accessible and fronted by a lobby area with an entrance that is separate from our church and school. The main multipurpose space can be furnished with sixteen 8-foot tables, four 6-foot tables, 16 round tables, and 300 chairs. Our Cafeteria is located in our basement, but is reachable by elevator and a wheelchair-accessible exterior entrance. It can be furnished with fifteen 8-foot tables and 4 round tables. The Media Center is located on the second floor of our School, adjacent to our Library. It is suitable for small group meetings. For more information, click here for our rates and rental policy, or fill out our online request form.